MANHATTAN (CN) – The Second Circuit backed the U.S. government on Tuesday for its refusal to share what could be hundreds of photographs depicting torture at Abu Ghraib prison. After 14 years in court, the federal appeals court agreed with the government that if released the photos could be used as a recruitment tool for the Islamic State group and otherwise harm U.S. personnel abroad. The ACLU filed a request to access the photos under the Freedom of Information Act request in late 2003 — six months before the CBS news program “60 Minutes” broke the scandal by broadcasting photos of abuses that had taken place at the Iraq prison camp. A federal judge would ultimately order the government to make the photos and other materials with redactions, but this ruling became moot in when a third party leaked the photos and they were posted online at Salon.com. The government uncovered additional photos in the meantime, however, and again tried to withhold them under the FOIA exemptions. Following a ruling from a federal judge, the newly found photos were set for release in May 2009 but but the Obama administration reversed course after a plea from Iraq’s prime minister, who claimed the photos could stir another insurrection and cause chaos in the embattled country. Later that year the administration invoked the recently passed Protected National Security Documents Act in support of its claim that the photos were exempt from disclosure. The PNSDA categorically protects from disclosure any photos of U.S. military prisoners held from 2001 through 2008 that the secretary of defense deems too dangerous to release. ISIS reportedly uses photos of abuse at Abu Ghraib as a recruitment tool, and the group’s leader Abu Bakr al-Baghdadi was said to have once been a detainee at the prison. While the government appealed an order from the U.S. District Court in Manhattan to release the photos, the Defense Department in 2016 released 198 new photographs that documented the wounds to prisoners. The Second Circuit reversed Tuesday for the government, saying it had adequately reviewed the photos and rightly determined they were protected under the PNSDA. “Courts are not well-suited to evaluate the constantly evolving military conditions and national security challenges faced by U.S. forces and personnel,” U.S. Circuit Judge Richard Wesley wrote for the three-judge panel. “Judges do not abdicate their judicial role by acknowledging their limitations and deferring to an agency’s logical and plausible justification in the context of national security; they fulfill it,” the 28-page opinion continues. Wesley rejected the ACLU’s argument that the secretary of Defense needed to review every photograph individually to certify it was exempt from disclosure. “Despite the assertion to the contrary, there is sufficient information before us … to evaluate the secretary’s decision to certify the withheld photographs, based on the endangerment of U.S. lives and personnel abroad, was logical and plausible,” Wesley wrote. The ruling emphasizes that various attorneys and other military personnel at the Defense Department conducted three separate reviews of each photograph before reaching consensus on which should remain sealed. This is more than enough, the judges found, to prove the military appropriately vetted the photos,. “The fact that the reviewers recommended 198 photographs for release tends to confirm that this process occurred,” Wesley wrote. Wesley also noted that the secretary of defense received important context from the commanders of U.S Central Command, U.S. Africa Command, and U.S. forces in Afghanistan, as well as the Chairman of the Joint Chiefs of Staff, which had opposed releasing the photos for fear of endangering U.S. personnel. In a concurring opinion, U.S. Circuit Judge Dennis Jacobs wrote that the government satisfied the time-period and subject-matter requirements under FOIA. But the ruling came as a blow Tuesday to the ACLU. 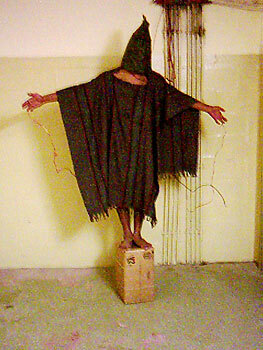 The U.S. military prison at Abu Ghraib gained international notoriety in 2004 after graphic photos of abuse involving military dogs, leashes, broomsticks, and other instruments were released. One of the photos—taken by an Army staff sergeant of a hooded man with electric wires attached to his fingers—has became an iconic representation of the abuse. The scandal still reverberates today, with several lawsuits still active against contractors and others allegedly involved.